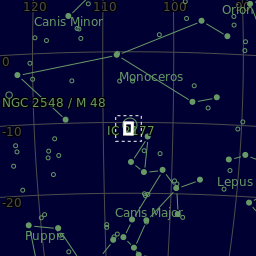 A region of nebulosity that lies along the border between the constellations Monoceros and Canis Major and is close to Sirius, the brightest star in the night sky . 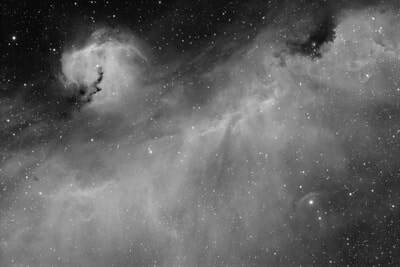 The nebula lies more than four hundred times further away than that famous star. It is a roughly circular H II region centered on the Be star HD 53367. 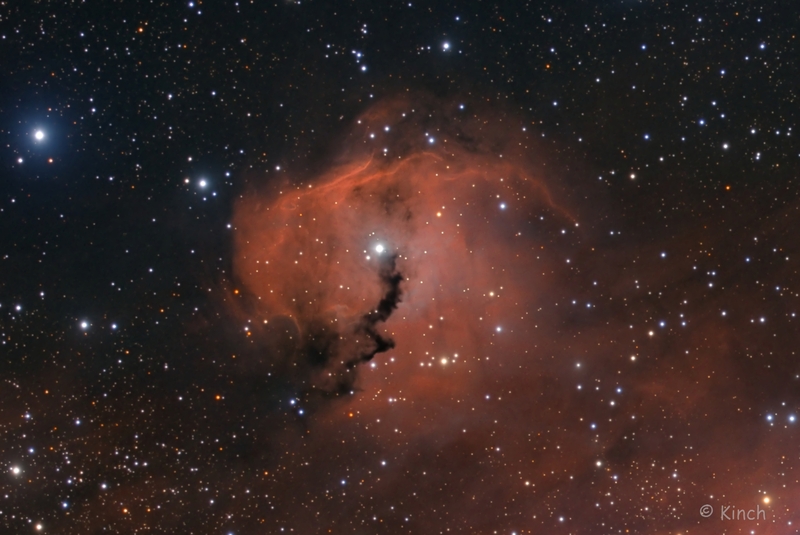 Although a small bright clump in the Seagull Nebula complex was observed for the first time by the German-British astronomer Sir William Herschel back in 1785, the greater part had to await photographic discovery about a century later. 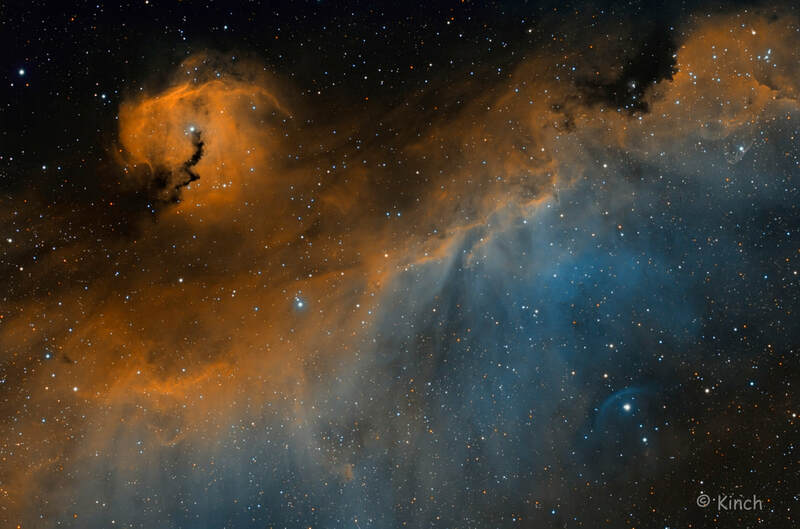 This was discovered by Welsh amateur astronomer Isaac Roberts and was described by him as, "pretty bright, extremely large, irregularly round, very diffuse." 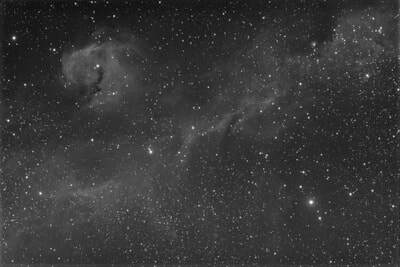 The name Seagull Nebula is sometimes applied by amateur astronomers to this emission region, although it more properly includes the neighboring regions of star clusters, dust clouds and reflection nebulae. 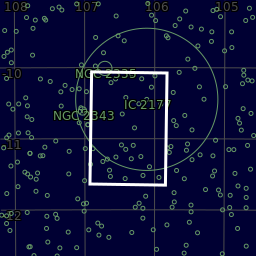 This latter region includes the open clusters NGC 2335 and NGC 2343. The complex of gas and dust that forms the head of the seagull glows brightly in the sky due to the strong ultraviolet radiation coming mostly from one brilliant young star — HD 53367 — that can be spotted in the upper left quadrant of the image and could be taken to be the seagull’s eye. 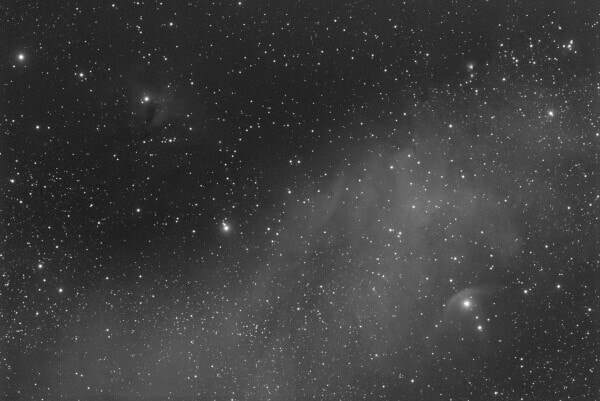 Center (Dec, dms):-10° 51' 24.321"
Narrow Band & RGB data mix. 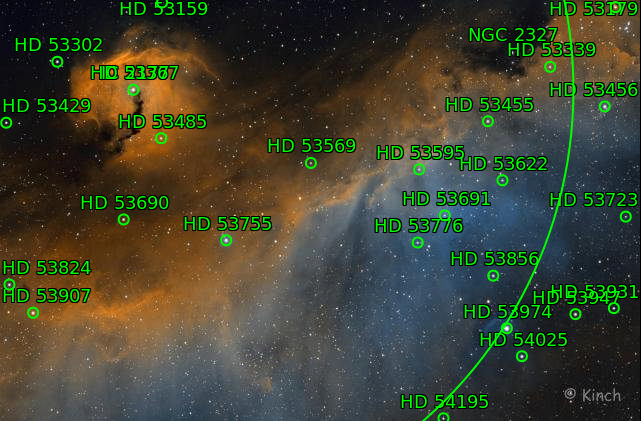 "Your star is HD 53974, also known as FN Canis Majoris. 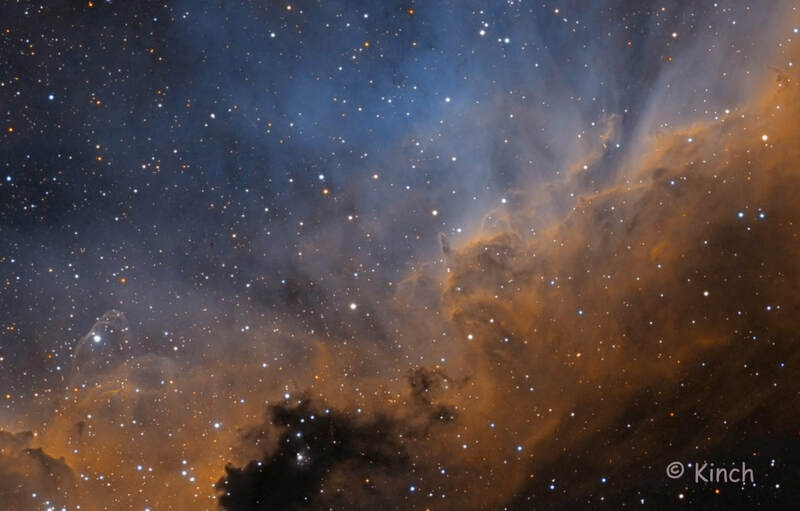 FN CMa is a powerful star of spectral class B0.5IV, a massive star which may be some 5,000 times brighter than the Sun in visual light. FN CMa may be in the beginning of the instability that follows when a star has exhausted its core hydrogen. 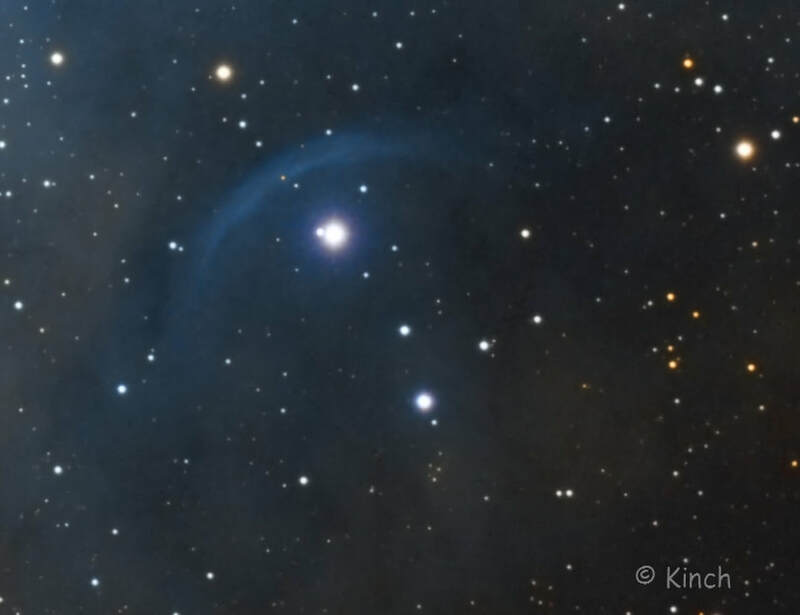 It makes good sense that such a star would cause an arc that glows blue."